Three Tough Races in Three Days. In it’s 25th year (2019) this promises to be a real celebration of running! TECHNICAL T-Shirt (not cotton) to those who pre-enter by 26th May and then complete all three races. Postal pre-entry for all three races combined costs £17 EA attached, £21 unattached for entry on or before 26th May. On-line entry is slightly more expensive than postal entry due to booking fees. Prices for Day 1 and Day 2 rise by £2 per race for entries received on or after 26th May. 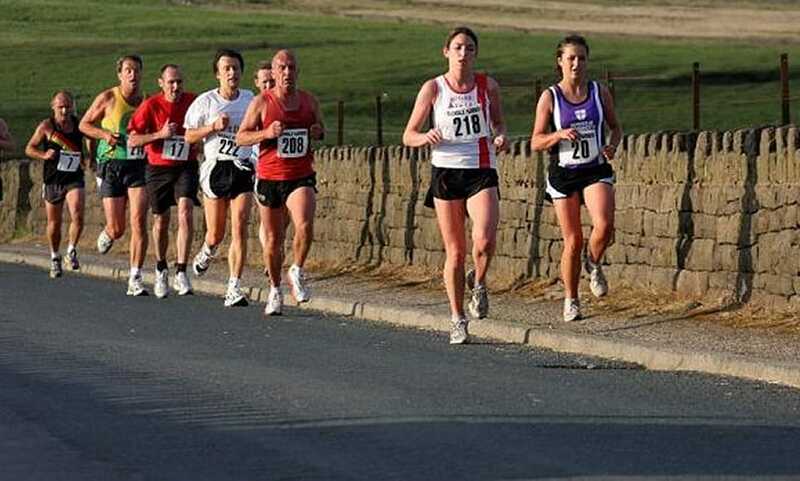 A breathtaking course (in every sense) with stunning views on the climb up Edenfield road and during the descent down Ashworth Valley Road (more detail). Postal pre-entry by 26th May: £5 EA attached, £7 unattached. £2 extra to enter after the pre-entry deadline. An undulating, three lap course through Naden Valley, School Lane, across the stream and past the Three Owls Bird Sanctuary (more detail). Postal pre-entry by 26th May: £5 EA attached, £7 unattached. £2 extra to enter after the pre-entry deadline. The most popular of the three due to the scenery, route and advertising in the FRA handbook – a Category BM Fell Race (1300′ total climbs) passing Higher Naden Reservoir, up to the top of Knowl Hill (1380′), down between the 4 reservoirs, back up then down past Dr Dam lake to the finish (more detail) £5 for everyone. Pre-entry will be possible on-line.